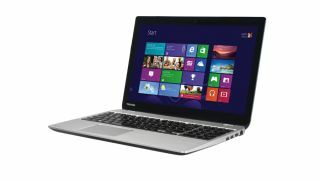 Toshiba has introduced two new laptop ranges fitted with Intel's fourth generation Haswell CPU. The Satellite U50t is the company's first 15.6-inch Ultrabook. It sports an HD touchscreen with 10-point touch for pawing around Windows 8, shared Intel HD 4400 graphics, up to a 1TB HDD and a maximum of 16GB RAM. It weighs 2.3kg and measures 21.3mm at its thickest point. Joining it are the new Satellite M Series laptops equipped with a choice of a Haswell or AMD APU processor. They come with a 15.6-inch screen with optional 10-point touch and offer up to a 1TB HDD with up to 16GB RAM. Graphics choices are present in the form of Intel HD 4400 graphics, an Nvidia GeForce GT 740M with 2GB VRAM or AMD Radeon HD graphics (if you opt for the AMD APU). Connectivity-wise, both series of laptops feature two USB 3.0 ports, one USB 2.0, one HDMI v1.4 with 3D TV support, an SD card slot, Gigabit LAN, Bluetooth 4.0 and Wi-Fi 802.11 b/g/m. No 802.11ac to be found here. They do however get DTS Studio sound designed to boost surround sound, and both feature an HD webcam with a stereo microphone. Toshiba is claiming up to seven hours of battery life in the models. The Satellite U and M Series laptops are due for release from the third quarter of this year, with pricing yet to be confirmed.